Popeye the Sailor debuted in E.C. Segar’s Thimble Theatre on December 19, 1919. 62 years later, he got a letter published in Superman#366 (cover date – December 1981). Seems strange, doesn’t it? A cartoon/comic strip character getting a letter published? Well … yeah! So, what’s the story behind it all? I’m glad you asked. You see, in 1973, comics writer Cary Bates created Captain Strong, DC’s version of Popeye, essentially allowing DC’s heroes to interact with Popeye the Sailor … or a reasonable facsimile, at least. 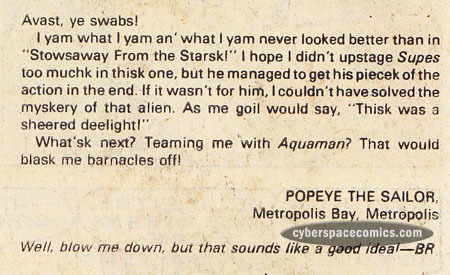 And, what Popeye is referring to, in this letter, is his (Captain Strong’s) team-up with the “Man of Steel” in Superman #361. 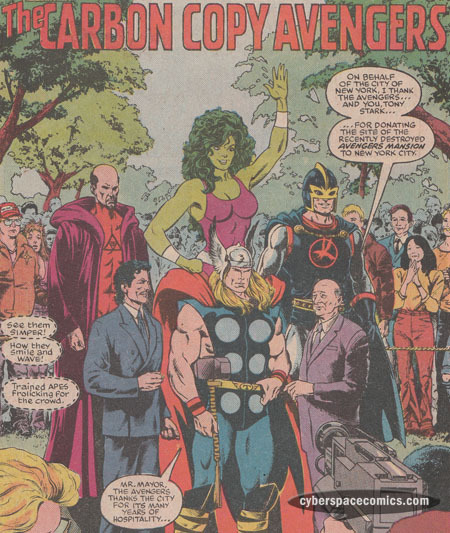 After Avengers Mansion was destroyed, Tony Stark and the team donated the land to New York City. Mayor Ed Koch was there to extend his hand in appreciation in X-Factor #32. 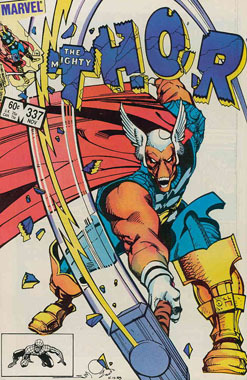 Beta Ray Bill‘s debut has been swiped a few times. 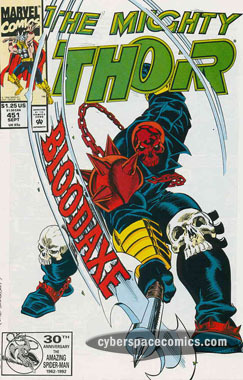 In #451, it was done as an homage, bringing an important, new character (Bloodaxe) to the forefront. 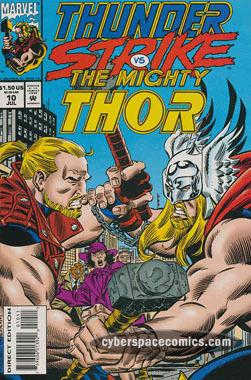 Later, in Thunderstrike, when the titular character gained control of Bloodaxe’s weapon, it corrupted the hero – leading to his death. Merlin discovers that Modred intends to locate the ebony blade, Chaos the Doombringer (the evil twin sword to mighty Excalibur), in an attempt to overthrow King Arthur and take the throne of Camelot. And so, the legendary wizard recruits Richard of Scandia to find the ebony blade first – and destroy it. Richard’s twin brother Percy, the minstrel, decides to come along on the quest and the two are met with witches, vampire bats, zombies and other dangers on their journey. After securing the ebony blade, the twins bring it back to Scandia, where Merlin commands them to destroy it. However, now wielding the blade, Percy finds himself strongly influenced by its evil and he decides to hold on to it for a while. Later, while walking through a darkened alley, he’s attacked by Modred’s men, attempting to steal the sword for their master. Richard and Merlin arrive at the battle … but, not soon enough to stop Percy from being slain. The surviving twin takes up the ebony blade and manages to defeat the evil forces. Afterwards, Richard decides to implement a ruse where he will pretend to be his slain brother, Percy. And, brandishing the ebony blade (against Merlin’s wishes), he vows to use it to protect King Arthur and his throne. Holy retcon, Batman! Sooooooooooo, the original Black Knight (who had his own series in 1955; of which, this issue is a prequel to) was not really Sir Percy of Scandia … but his warrior brother?! Wow! That’s quite a change made to a story that was published well over 50 years ago. Retcon aside, it’s a fun adventure story with great, classic-style art by Frenz that fits the tale (and its prequel status) perfectly. 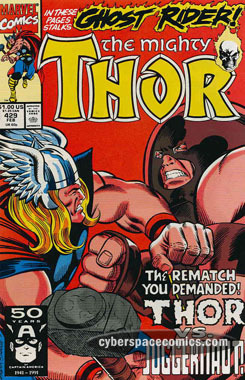 There’s a lot of story told here and it adds an interesting twist to a very early part of Marvel’s history. We’ve spent a few weeks looking at various Minimate offerings based on the film’s portrayal of the main characters, which Art Asylum took great care in producing. It was tough narrowing down which figures to do features on, since just about all of them were extremely well made. 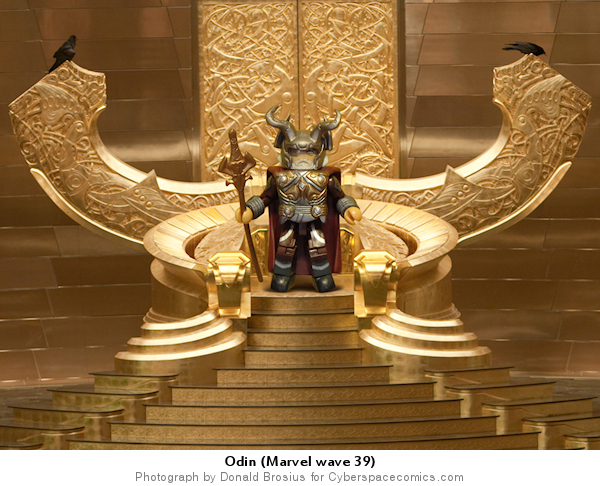 In the end, I decided to showcase the most prominently fantastic looking releases (leaving out Civilian Thor, Jane Foster, and Agent Coulson, among others) … and so, to wrap up our 4 week-long spotlight on the Thor Moviemates, here is none other than Sir Anthony Hopkins’ portrayal of Thor’s super powerful daddy: Odin. 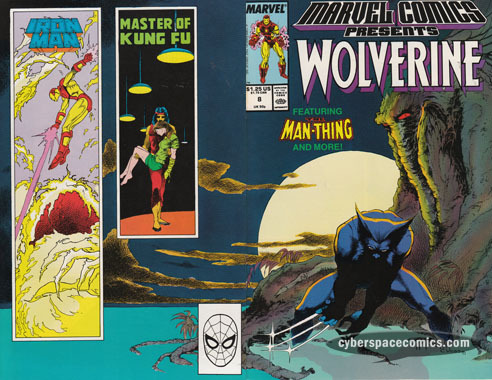 Wolverine and the Tyger invade Roche’s stronghold to rescue O’Donnell. The Tiger takes on Sapphire Styx while Wolverine comes face to face with Razorfist! As the assault on Marea’s den continues, the Man-Thing lunges into action, destroying the attacking commando unit. And, over in California, the mutated experiment formerly known as Senator Wycombe rages against the metal prison he’s locked within. In this concluding chapter, Shang-Chi has his final showdown against Argus, the terrorist leader who claims to have killed Leiko Wu. Our hero comes out the victor but, not before Argus infects him with a chemical agent that will eventually kill him. With the villain beaten, Shang-Chi discovers that Leiko Wu is still alive – the story of her death was no doubt intended to throw off Shang-Chi’s mental state. Tony Stark explains to his AA meeting how he’s used the principles he’s learned. He tells them that he created a problem and then used his AA lessons and support to devise a way to solve it, instead of just giving up. Now, what the other AA members don’t realize is that Tony Stark is actually Iron Man. The problem he created was accidentally summoning Zzzax but, he didn’t give in to the energy-based villain. Instead, he devised a way to short circuit the electrical monster. 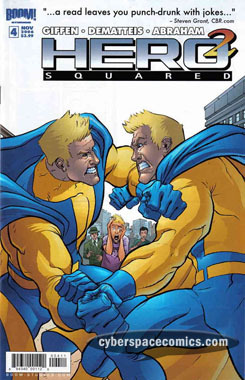 This issue marks the first conclusion of one of MCP’s multiple part storylines. The Shang-Chi story provided a powerful impetus for bringing the Master of Kung Fu out of retirement. Not only did he save his former flame’s life but, he took down a terrorist organization (with the help of the Cat and other friends). It also established a new (although, mostly familiar) status quo for our hero – the “new” part is that he’s now infected with a chemical agent that will supposedly kill him within a year. Fortunately, his next appearance in Master of Kung Fu: Bleeding Black, addressed the issue of the slow-acting poison. As for the Iron Man story, I’ve got to say that I’m typically fond of stories like this – where the narration is similar to what’s actually going on but, still vastly different (or at least, not fully developed, intentionally). And, from a Marvel history point of view, this story is quite important as it establishes the separation of General “Thunderbolt” Ross from Zzzax (which was initiated in Incredible Hulk #327). Michael T. Gilbert is best known for his reimagined hero (and now the more prominent version), Doc Stearn … Mr. Monster! But, before that he was an indy comic creator known for his creation, the Wraith (a parody of Will Eisner’s the Spirit). 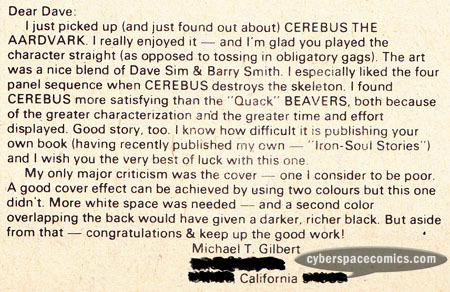 It was at this time in his life that he got a letter published in Cerebus the Aardvark #5 (cover date – August 1978). He also included a sketch pairing the Wraith with Cerebus. Through Apocalypse‘s video monitoring screen, we are witness to President Ronald Reagan signing the Mutant Registration Act into law in X-Factor #25. 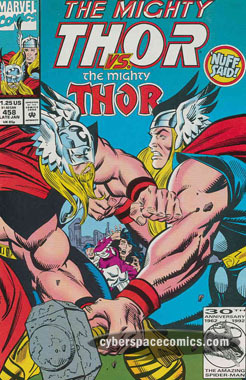 It may seem strange but, the first comic titled Thor was issue #126 (not #1!). 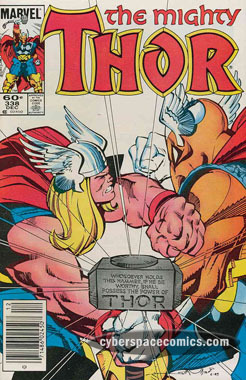 You see, he first debuted in Journey Into Mystery #83 and continued to be the main feature in that title until it was officially renamed Thor in 1966. 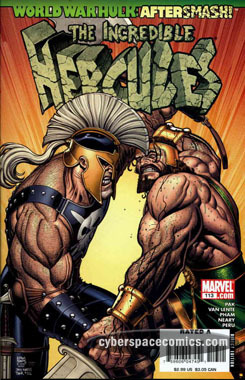 This book featured a battle with the Olympian demi-god, Hercules and has gone on to be homaged many times over the following years. 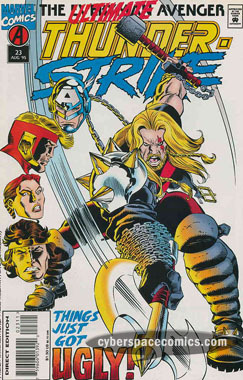 This tale takes during Nicieza’s original run on the Thunderbolts, after Scourge’s identity was revealed to be Jack Monroe (aka Nomad). Utilizing his image inducer, Jack hits the road to learn about the past of some Thunderbolt members from their friends, families, neighbors, etc. As he progresses from town to town, he uncovers some interesting insight into the motivation and history of Songbird, Moonstone, Atlas and Mach-IV. Afterwards, he meets up with Rock Python (another villain-gone-straight) and he encourages him to stay on the straight and narrow path. 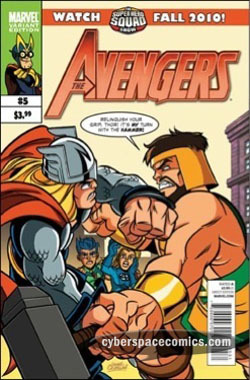 As a Thunderbolts fan, it was fun for me to see this “lost tale”. 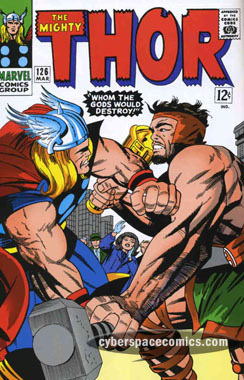 At first, it took me a while to get into the groove of things (after all, I hadn’t read this run in nearly 10 years!) but, once I did it was great to experience some unseen insight into these characters I had once followed. It also set up a new angle for Jack Monroe as a nomad wandering from town to town, helping villains redeem themselves. Unfortunately, this direction was never followed up on but, it’s a cool look into what might have been.